This article is going to be somewhat non-typical for TourMyCountry.com: The idea of this website is to show things that tourists would normally not find in Austria. In this case, I will describe a tourist attraction of Vienna that receives a lot of attention from foreign travellers - but rarely any from native Viennese. For the longest time, Grinzing was a village and a small cluster of vineyards in its surroundings. It was not unusual at all, Eastern Austria was - and in many areas still is - full with settlements of this kind. 1892, Grinzing was merged with Vienna. In the 20th century, Grinzing was finally transformed into what it is now: A combination of a wine and tacky folk culture theme park for international tourists and - beyond the main square - a very exclusive residential area for Vienna. A few words on the history of Grinzing: The oldest written record of Grinzing dates back to 1114, when it was referred to as "Grinzigan". The "-ging" ending means "people of" and refers to a settlement with a local landlord by the name of Grinzo. Faithful readers of my website will remember what happened to a certain hamlet in Upper Austria that derived from a landlord called Fucko. The "Grunzinger" family, the local landlords, can be tracked back to the 11th century. They built the so-called Trummelhof as their residence; remains can still be found at Cobenzlgasse 30 (remains of the house, not the family, that is). The last Grunzinger died in the 14th century without a heir; he left a blooming and booming small town that had grown wealthy on wine. Just like many other communities in the area, Grinzing was feudalistically administered by the monastery of Klosterneuburg - which lasted up to reforms in the 19th century. The church of Grinzing, still one of the main attractions of the neighbourhood beyond its many taverns, was built in 1426. Since it was maintained by the monastery of Klosterneuburg, it didn′t become a parish church until 1783. It is a Gothic church that was recently refurbished. In early modern days Grinzing was less lucky than in the Middle Ages. The rioting troops of the rebel Matthias Corvinus looted the town in 1484; in 1529, the Turkish Army came to Vienna for the First Siege and caused much damage and trouble. In 1604, a devastating fire destroyed many of the old burgher houses of Grinzing; and in 1683, the Turks returned upon the occasion of the Second Siege of Vienna. In the early 18th century, Grinzing was hit hard by the Bubonic plague. Nevertheless, Grinzing was still better off than its neighbouring villages and took a leading role as a transport and administrative hub. Real growth of Grinzing, however, started only after 1850. In 1892, it was finally merged with Vienna. 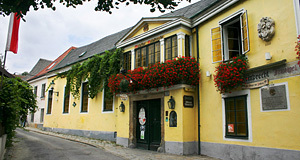 After WWII, most Heurige (wine tavern) inn keepers were no professional wine farmers anymore. Instead, Grinzing was increasingly commercialised. In the past few decades, a trip to Grinzing has become a "must do" thing for many tourists, which in turn resulted in dwindling numbers of locals going there. Most Heurige in Grinzing have parking lots for busses and are densely crowded by travelling groups of North Americans or Japanese tourists. In 2005, the Green Party of Vienna brought up some ideas to decrease the traffic in Grinzing. There was a citizen movement that wanted to apply at the UNESCO for a "World Cultural Heritage Site" status - however, this was rejected by the authorities since - as they said to the dismay of the local tourism officials - Grinzing is neither unique nor particularly well-preserved. I doubt that this will harm the development of Grinzing. Read my introduction to "Heurige Wine Taverns" for what this traditional kind of tavern is meant to be; in Grinzing, most Heurige have become mass-feeding-institutions or high-end restaurants, both sorts with live but tacky folk music ("Wiener Schrammelmusik"). This is particularly sad, as the village itself comprises of many very charming houses. Once you leave the main street and market square area, you get to the residential surroundings with many very attractive houses. You can walk up to the Wiener Höhenstraße and the Cobenzel area; or you walk southwards to the Hohe Warte. Another attraction of Grinzing itself is the village′s 19th century cemetery. The Grinzinger Friedhof has celebrity corpses such as Gustav Mahler, his widow Alma Mahler-Werfel, the nationally known actor Attila Hörbiger, Heimito von Doderer (he of the Strudelhofstiege) and the writer Thomas Bernhard.